Battle of Dazar'alor's Mythic World First race is well underway! NEXT | How do you make gold these days? On your marks, get set, go! The top World of Warcraft raiders from around the world have had an amazing first day at the races! North America had a day’s lead and Limit has managed to clear 7/9 bosses so far. Big Dumb Guild got the very first mythic kill in the world only 10 minutes after the raid opened. After that, it was neck and neck with bosses being killed only minutes apart. Opulence proved to be the first wall but Limit plundered that treasure pile after about three hours of wiping. Currently Limit is the only guild in the world to have managed to kill High Tinker Mekkatorque. 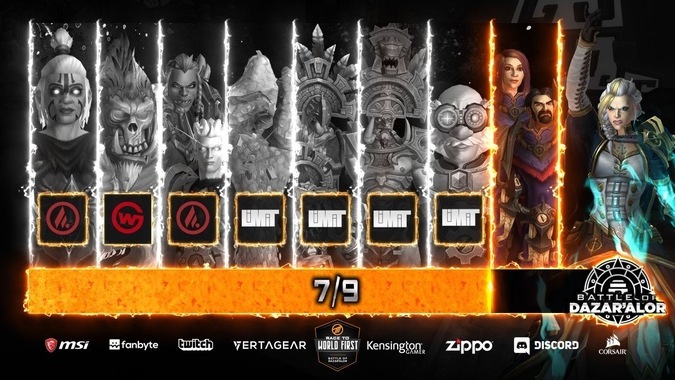 Wildcard Gaming and Big Dumb Guild are in second and third place behind them as the only other guilds to have beaten Mythic King Rastakhan. When the servers opened up for Europe, things played out pretty similarly with the Champions of the Light being downed 14 minutes into the race. Method has quickly jumped to the front of the pack. At the time of writing, they are 5/9 after defeating the Conclave of the Chosen, jumping up to 6th in the world — and taking less time than it took Limit. Exorsus is nipping at their heels but they have been running a unique tank strategy for Opulence. Running a pair of Blood Death Knights to help with controlling the extra adds during the fight, but giving up the utility brought by Paladins. It put them further behind and with a race this close, every pull counts. If you’re interested in checking out the action yourself we’ve seen streams from most of the major players. Keep in mind that these streams will likely have a NSFW chat or use strong language on the stream itself — emotions do tend to run high during these sorts of events. 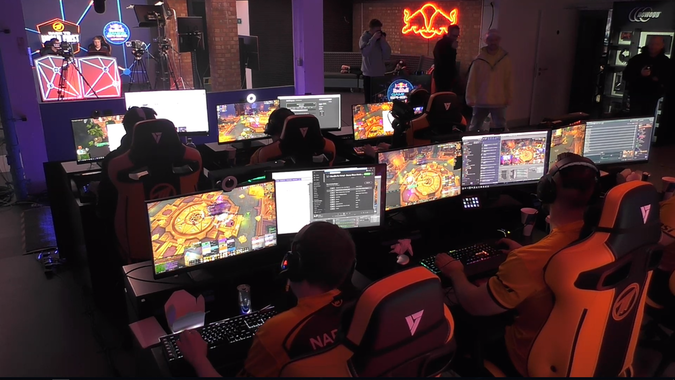 Method has the biggest setup, with 7 of their players playing from the Red Bull Gaming Sphere in London and one central stream with additional commentary. Exorsus also has multiple streams from different viewpoints on their Twitch team. Limit has elected to not stream their attempts, choosing instead to focus solely on their progress. They are keeping their page on HeroesHearth up to date so you can see as they get bosses down and when they choose to call it a night. If you’re interested in going deeper into roster and trait choices Raider.io has detailed breakdowns allowing you to see every Azerite trait and trinket choice. These guilds have been just flying through the raid with bosses falling much more quickly than we saw in Uldir. The Stormwall Blockade and Jaina are the only ones left standing as of this writing and at this pace I’m wondering if we’ll see them last the full week — or even until this post gets published. I am looking forward to another Limit and Method head to head on the final boss. During Uldir, Limit had almost pulled off the win but had a wipe at 4% allowing Method the chance to squish G’huun first. I love that we’re getting these opportunities to see what goes into the race for first, and can’t wait to see who wins!